The authors of Freakonomics (2005) and SuperFreakonomics (2011) now share techniques for training your mind to think differently, a prerequisite for foresight. 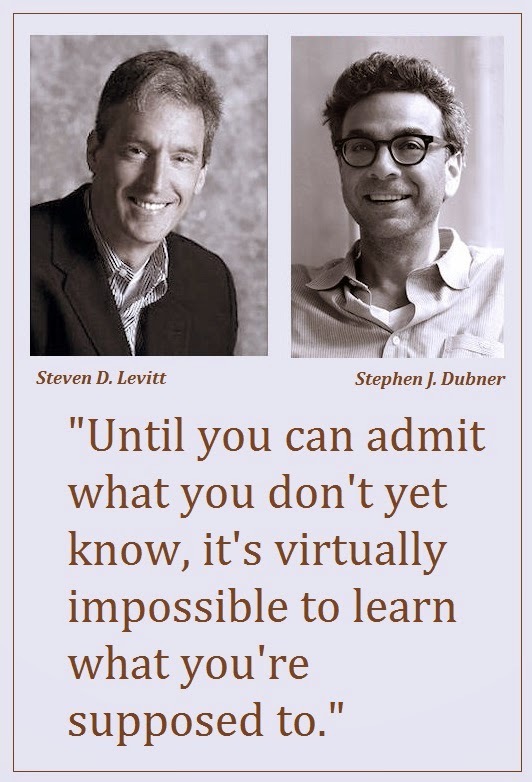 The process is at first humbling, then rewarding, promise University of Chicago economist Steven D. Levitt and journalist Stephen J. Dubner. Why humbling? Because one of the first things that anyone doing any kind of research needs to be able to say is “I don’t know.” And it is this very phrase that most professionals are reluctant to utter, whether to a supervisor, a client, or a child. Forecasters who rely on extrapolating trends into the future, without regard to alternative possibilities, may simply be bluffing—or, worse, imposing their own dogma onto the projected landscape, the authors warn. But which is worse, admitting up front that you don’t know, or ultimately being proven wrong? As in the case of Iraq’s possession (or not) of weapons of mass destruction, sometimes “the societal costs of faking it can be huge,” the authors note. Another humbling technique for freakier thinking is to think as a child would. Magicians know that children are harder to trick than grownups are, because magic, or illusion, is based on diverting the audience’s attention with social cues: When they point to the hand that does not have the ball, grownups follow the cue while children follow the ball. As grownups, we need to unlearn some of these social cues in order to think like a freak—er, child. Childlike thinking also involves breaking down big problems into smaller ones. For instance, with the big problem of improving academic achievement, the big, grownup solution is to overhaul education systems. But as Levitt and Dubner point out, “One in four children, it turns out, has subpar eyesight, while a whopping 60 percent of ‘problem learners’ have trouble seeing.” So a smaller solution to our big problem might be to improve vision screening. Think Like a Freak is well-populated with case studies for freaky thinking in business, which should prove of value to futurists and foresight professionals working with business trends and clients. Much of this relates to developing persuasiveness, clearly a key trait to success in any endeavor. Finding the right incentives, for instance, has enabled Zappos, the online shoe sales company, to attract outstanding talent to its team and give customers more than an easy way to buy shoes. What Zappos offers customers besides shoes, according to Levitt and Dubner, is friendliness, turning its customer representatives into talk therapists. Wouldn’t that cost more? Rather than higher salaries, Zappos offers its reps more power, more authority to resolve customers’ problems; it also makes work more fun. Persuading those who do not want to be persuaded is another tough act of freaky thinking. For example, not everyone buys into the trendy idea that Driverless cars are the future! Clearly, professional drivers whose jobs would be in jeopardy are not persuaded about this vision, nor are environmentalists who foresee more cars being put on the roads, exacerbating congestion and pollution. But rather than insulting such critics, calling them luddites, proponents of driverless cars should acknowledge the strength of the arguments, Levitt and Dubner suggest. Finally, the bravest act of freaky thinking may very well be admitting failure. We certainly value fortitude and determination, but not obsessiveness in the face of futility. Quitting isn’t failure, the authors remind us; failing is failure. The upside to quitting—to recognizing a brick wall before you hit it—is reserving resources and resilience for finding a way around, over, or even under that brick wall. Of course, we don’t want future Edisons to abandon their light bulbs before they get to the eleven-thousand-and-first experiment that finally succeeds. So how do you predict failure before it happens? One freaky idea is to use “pre-mortem” (as opposed to post-mortem) analysis, in the terminology of psychologist Gary Klein, offering team members on a project the opportunity to (anonymously) imagine everything that could go wrong and the reasons behind a potential failure. 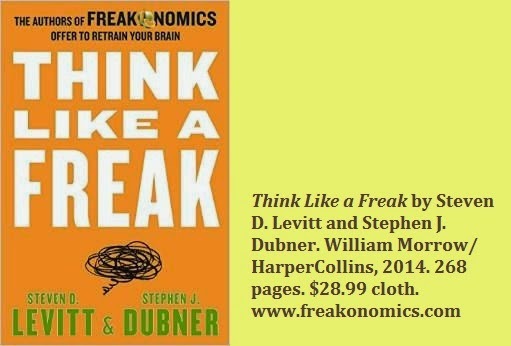 Basically, thinking like a freak is about thinking “a bit differently, a bit harder, a bit more freely,” write Levitt and Dubner. And these are activities we surely ought not to quit. Cynthia G. Wagner (@CynWag1) is the consulting editor of Foresight SIGNALS. Photos via Amazon.com authors’ pages.